AWS...Complex Simplicity? - VIRTUALIZATION IS LIFE! I came across a tweet over the weekend which showed a screen grab of the AWS product catalog (shown below) and a comment pointing out the fact that the sheer number of AWS services on offer by Amazon was part of the reason why they are doing so well. I’ve held a view for a while now that in order to go head to head against AWS Cloud Service Providers don’t need to go out of produce 1000+ cloud services…rather they should focus on keeping things figuratively simple by focusing on core strengths and doing what they do really well…really well. 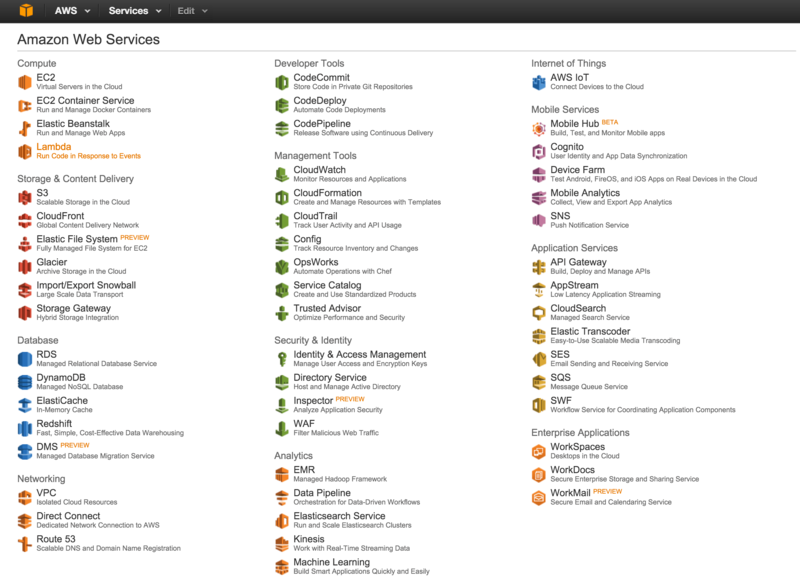 Maybe I lack the impartiality to comment on this, but when I look at the AWS services page I get overwhelmed…and while from a technical point of view I can work through the configuration steps and multiple addon services…For small businesses looking to take their first steps into a hybrid cloud world AWS is not the panacea proclaimed by some. Even for small to large enterprises the simple fact AWS carries so much apparent choice should throw up some flags and be enough to make decision makers look at smaller more streamlined offerings that offer targeted solutions based on actual requirements. AWS are massive…AWS are a juggernaut backed by seemingly endless research and development funding and enough scale to offer what appear to be cheaper services…and though they don’t market as much as Microsofts Azure they are still front of mind for most when cloud is talked about. Smaller providers such as IaaS in the vCloud Air Network can complete if the focus on delivery of a smaller subset of products and services is done with quality and reliability in mind…in my eyes, that’s enough to offer enough differentiation to compete. So as a final thought…lets not be caught up with what customers think they might need…but what they actually require! AWS is indeed a one-stop-shop. Buying into the AWS ecosystem has many advantages for those that want to create highly scale-able and resilient applications in the cloud. Of course, one could replicate these services using other cloud hosting providers and open source solutions. That approach may have some advantages for those with skilled architects and developers, however the increasing demand on IT shops and the speed-to-market that is required by entrepreneurs in today’s app market require a ready set of tools and services. AWS delivers on that like no other cloud provider. Depth of service is only one dimension to consider, however the other dimensions that one might articulate are also dominated by Amazon’s leadership. I find it hard to imagine how their momentum in this space will be slowed by the competition in the coming years. Juggernaut indeed. Great article and I totally agree. I recently passed my AWS Architect certification and while AWS is incredibly impressive, and I love it, that doesn’t mean all of my company’s customers do. The commenter above that states “VMware has one on-ramp to the cloud” sums up why I feel that vCAN providers will be able to provide great services to lots of customers for the next handful of years.